When a dog’s stomach fills with gas, it bloats. The expansion of the stomach puts pressure on the diaphragm, which in turn makes it hard for the dog to breathe. The stomach will also twist, causing terrible shock and rapid death. Therefore, bloating should always be treated as a dire emergency. 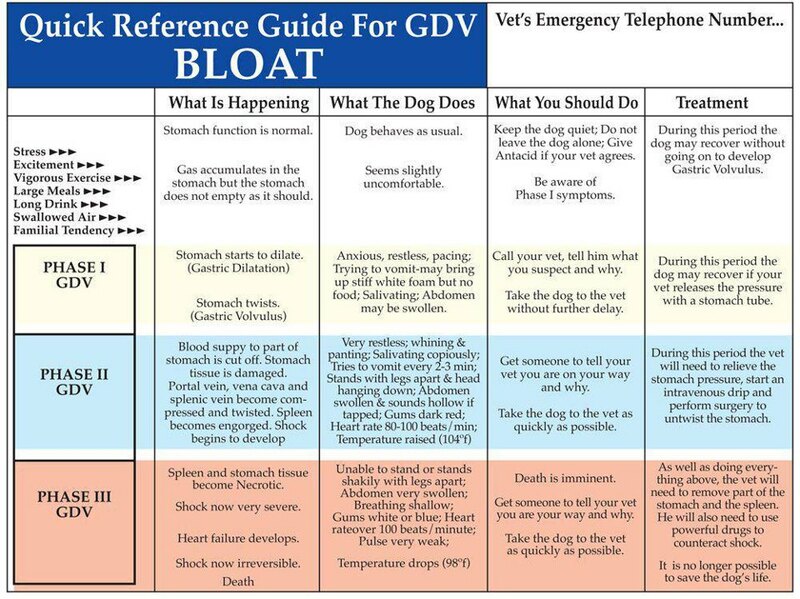 Bloating can happen to any breed of dog at any age. However, large breeds with deep chests, like Great Danes or the large Setters, are more likely to suffer from this type of emergency. In certain instances, bloating is noted when the dog exercises immediately after eating. The most obvious symptom is, of course, an enlarged abdomen. You may also observe labored breathing, excessive drooling, vomiting, a weak pulse, and paleness in the nose and mouth. Although there are environmental and genetic factors that remain unknown, the chances of bloating are increased by overeating and excessive drinking. Allowing a dog to exercise or especially roll shortly after a meal can also cause problems. Take the dog to a vet right away. There, she will be stabilized and likely undergo gastric decompression. Depending on the circumstances, you may need to treat the dog for shock on your way to the emergency hospital. Providing the dog normal-sized food portions and allowing her time to digest after a meal can help prevent occurrences of bloating, at all ages. Some veterinarians will recommend that breeds more commonly affected with bloating undergo gastropexy, a surgical procedure in which the stomach is attached to the body wall to prevent it from shifting or twisting.